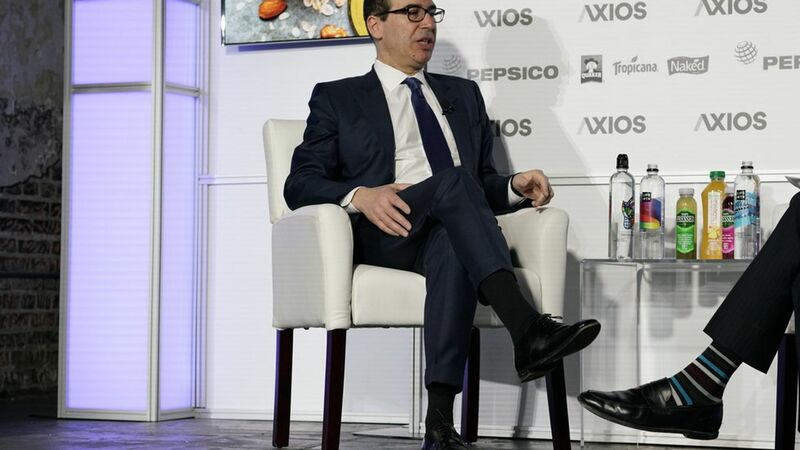 Treasury Secretary Steve Mnuchin, in a conversation with me yesterday morning at the debut Axios News Shapers event, said the administration will plunge into whole-hog tax reform: "We're reforming both the personal and the corporate side. We're not cutting this up and doing little pieces at a time." Mnuchin slid a bit on his earlier vow to finish tax reform by the August recess, saying that's always been the optimistic goal: "And if we don't, we'll get it done right afterwards." When I asked him if that meant it'd be done by fall, he replied: "Absolutely." On tackling another complex issue after health care: "In a way, it's a lot simpler. It really is. It's a lot simpler because the goals of tax reform ... creating a middle-income tax cut, about creating personal tax simplification, and making U.S. businesses competitive. ... I think there is very, very strong support." I asked him: "Pretend that I shop or work at Walmart. Make the case to me that the border adjustment tax is good for me." He didn't: "[T]here's certain aspects of that tax that are attractive, and there's certain aspects ... that are concerning. ... [O]ne of our concerns about it is that if the currency moves, then the Walmart shopper shouldn't be impacted. OK. But if the currency moves, that has an impact for our exporters."